Tue., June 26, 2018, 3:03 p.m.
SAN FRANCISCO – A wildfire in Northern California that forced about 1,500 people to flee their homes grew overnight and was heading toward a sparsely populated area in a region hit hard by wildfires in recent years, authorities said Tuesday. The fire in Lake County north of San Francisco was nearly 18 square miles, said Emily Smith, a spokeswoman with California’s Department of Forestry and Fire Protection. The blaze burning through dry brush, grass and timber has destroyed 12 homes and 10 other buildings since it started on Saturday. It is threatening another 600 buildings. Authorities over the weekend said residents had to evacuate all homes in the town of Spring Valley, where about 3,000 people live. Officials clarified Tuesday that only half of the residents faced mandatory evacuation orders. California officials said unusually hot weather, high winds and highly flammable vegetation turned brittle by drought helped fuel several blazes that began over the weekend, the same conditions that led to the state’s deadliest and most destructive fire year in 2017. Gov. Jerry Brown on Monday declared a state of emergency in rural Lake County. The declaration will enable officials to receive more state resources to fight the fire and for recovery. Jim Steele, an elected supervisor, said the county is impoverished and its fire-fighting equipment antiquated. He also said the county has just a few roads into and out of the region, which can hinder response time. 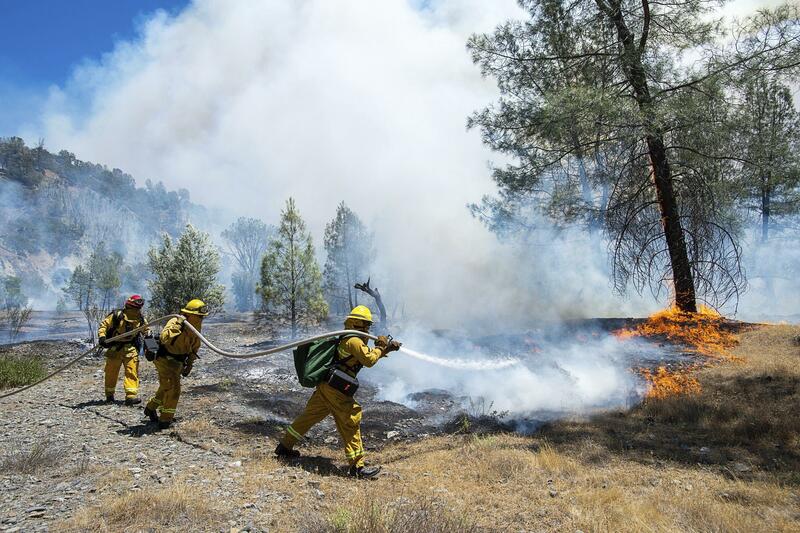 Steele said the area has also been susceptible to fire for many decades because of dense brush and trees, but the severity of the latest blazes is unexpected. “What’s happened with the more warming climate is we get low humidity and higher winds,” Steele said. The blaze is the latest in the county of just 65,000 people in the last few years. In 2015, a series of fires destroyed 2,000 buildings and killed four people. The following year, an arsonist started a fire that wiped out 300 buildings. “I think we’re all just so traumatized and overwhelmed with all these fires year after year, this whole community is at a breaking point,” said Terri Gonsalves, 55, who evacuated her home around midnight Sunday. More than 230 firefighters were battling the Lake County fire in a rugged area that made it difficult to get equipment close the blaze, Smith said. Residents also fled wildfires in Shasta and Tuolumne counties. At least a dozen blazes are burning throughout California. No cause has been determined for any of the fires. Last year, California’s costliest fires killed 44 people and tore through the state’s wine country in October, causing an estimated $10 billion in damage. Published: June 26, 2018, 3:03 p.m.